How Would You Configure Your $294,000 Porsche 911 GT2 RS? 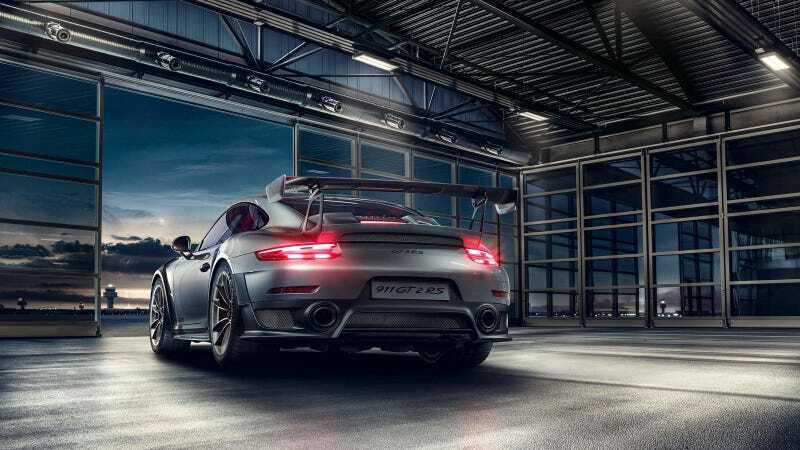 After a few days of not officially confirming a car that everyone knew about, Porsche dropped the curtain on the 700-horsepower 2018 911 GT2 RS, the most powerful 911 ever made. It’s pretty likely that these cars are already sold out, but what would yours look like? The 911 GT2 RS has a starting price of $294,250 including destination. The price is more than $149,000 higher than the one on the 911 GT3, but that car only has 500 HP. Apparently, the GT2 RS is for people who love 911s, but also like to crap their pants. But hey, if you have this kind of money to drop on a brand new Porsche, you have plenty of pants. There are a variety of colors to choose from, and Porsche will probably paint your GT2 RS with whatever color you like if you have the cash. The most over-the-top option is the $31,000 Weissach Package, in which Porsche adds a bunch of carbon fiber bits in an effort to save a few pounds. I spec’d mine in that lovely Miami blue and went crazy with the Alcantara for a total price of $347,000 even. The configurator is live, so go have some fun building one of the most insane 91s1 to ever leave the factory.